2. Back in the day, ladies never asked men to dance. That is one rule that is generally ignored in the modern "vintage" ballroom. Ladies need not wait to be asked in the Victorian age of the 21st Century. Conversely, men should not just sit back and wait to be asked, but assure that more reserved ladies get to dance as well. 5. Wear gloves. They are cheap and easy to find at Army Surplus stores and Tux shops. It is more sanitary and reduces sweat damage to ladies' gowns. I realize though that in the "Jazz Age", gloves were often out of fashion for both men and women. Let your conscience be your guide at a Jazz Age dance. 7. Do not wear hats in a ballroom. It's just tacky. If yours is the only hat being worn in the room, it's probably not because no one else's hat is as magnificent as yours. 18. Personal hygiene, both body and oral, for both men and women, is REALLY important. 'Nuf said. Submitted by Unregistered on Mon, 05/31/2010 - 1:41pm. Submitted by walter on Fri, 05/28/2010 - 9:59am. As a wife who always notices ladies who have not been invited much during a ball, and sends her husband to invite these ladies to dance, I really resent the feeding frenzy of the piranhas attacking my husband in the lobby before a ball and insist to be entered in his dance card. 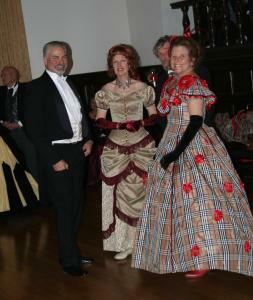 Because of the overwhelming gender imbalance at Vintage Balls, and the fact that most men do not invite older women to dance, I have on numerous occasions invited ladies to dance, going as far as dressing as a man at Regency balls, but I am getting a bit tired of that option. This problem did not exist a 100 years ago and even as recently as 50 years ago. We are trying to recreate the genteel and polite manners of the past but we forget that single, aggressive women would not have been allowed at a ball in those days. A debutante was either escorted by her father, a brother or a cousin. The reason an older woman would dance with a younger one (in less formal occasions) is that grandmothers often were attending a family gathering/dance to chaperon their granddaughters, and would teach them dance steps and invite them to dance. This was of course not the case for men. Re. Darlene's question about trying to gender balance an event: you have to ask, is it worse to have women sit out more than their share of dances, or to tell women who don't happen to have handy men in their lives that they cannot come unless some random unattached male should happen to show up? I for one come down on the side of not trying to regulate who can and cannot come to an event. I think that at the dance classes you should mention that women are welcome and even encouraged to lead, and that that would help even out the imbalance in available male partners. You can also add that no one expects you to fill your entire dance card before the grand march begins. When I started coming (with another friend), we got the impression (esp. watching those "piranhas" as you call them) that that was what the card was for. I suggest making a counter-offer rather than a flat denial. "I am so sorry I believe I'm taken for this dance but what about the next Hungoise Mazurka Quadrille?" Yes I have spent an entire dance searching for someone whose feet gave out long before her dance card. If you are left luggage for 32 bars, I say "All bets are off." If there are only 7 waltzes in an evening, watching one would be unconscionable.